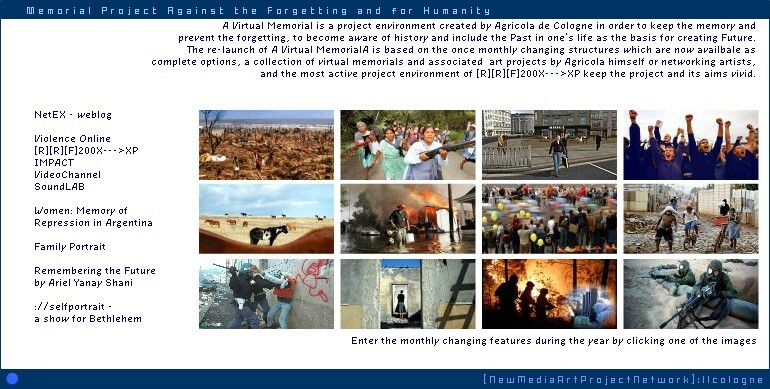 is hosting the Internet based project “A Virtual Memorial”, launched on 1.1.2000 as the first memorial, but this project cannot be thought without the creator’s, Agricola de Cologne, history and the key incident, the fall of the Berlin Wall in 1989, which again was the initial motivation for Agricola de Cologne to realise between 1991-1998 the artistic memorial project “A Living Memorial Spaces of Art – featuring “1000 Years, 50 Years, and still so terribly young” – launched on 27 January 1995 on occasion of the 50th return of the Liberation of Auschwitz and the end of World War II. 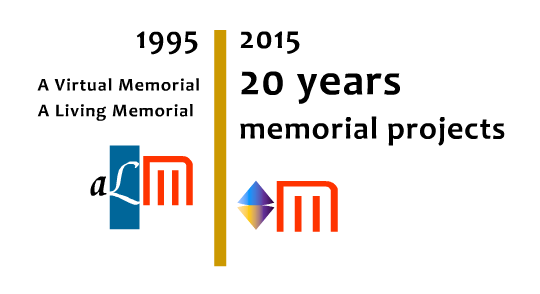 After 43 exhibition presentations in Poland, Czech Republik, Belgium and Germany, the memorial project was destroyed by an evil attack at the end of 1998. 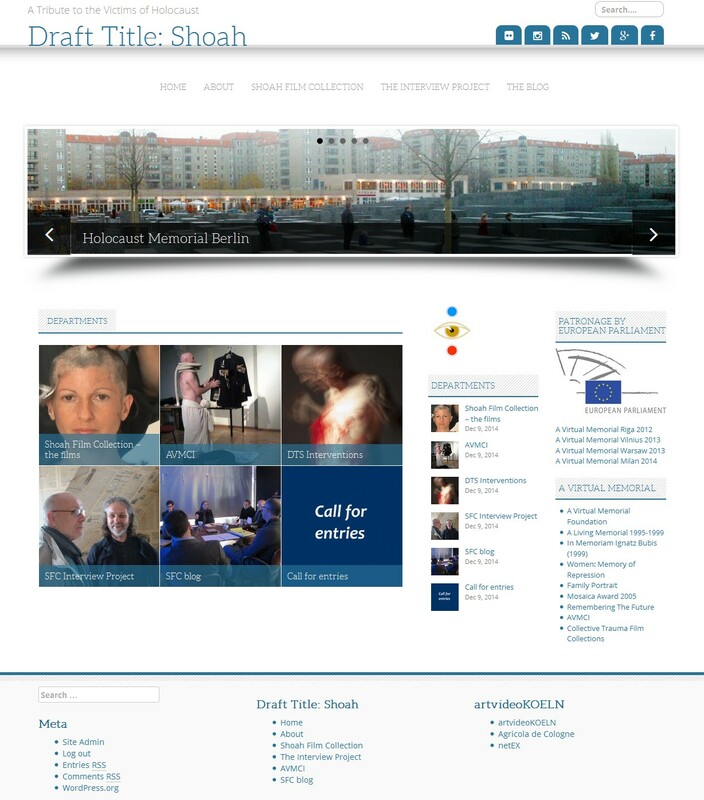 “A Virtual Memorial” can be considered the continuation of this project on a virtual, global level. The projects realised in the context of A Virtual Memorial Foundation are “virtual memorials” each one in a different way. Since the general concept changed according to the new perception that the “virtual” get its real meaning only when it is juxtaposed to the “physical”. In this way, after 2003 the concepts of memorial projects incorporated always also the exchange between virtual and physical space in most different ways. forming the actual body of A Virtual Memorial included countless small “memorials”, but form a memorial project for itself. This memorial environment was initiated after the 11 September terror attack in USA 2001, but serves generally as a memorial for the victims of terror. The project gets agagin and again relevence when terror attacks happen in different parts on the globe and artists are asked or feel addressed to show their solidarity with the victims via art contributions. This project was initiated in 2002, on occasion of World AIDS Day on 1 December. Unfortunately such a memorial became necessary, not only bcause meanwhile millions of people in the Western societies died of AIDS, but basically countless victims in Africa and other poor regions of the world where HIV infections are still rapidly increasing, and the victims vanish and die in anynomity. 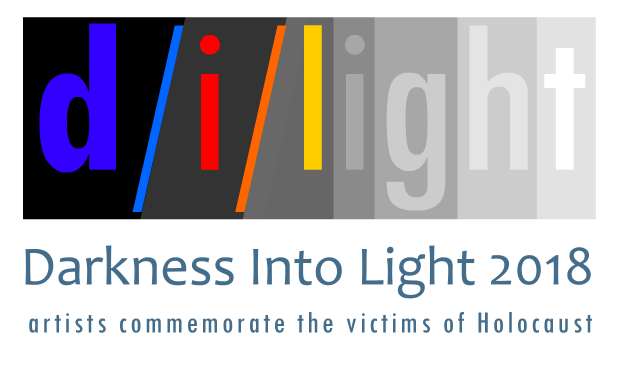 Artists are invited to express their solidarity thorugh artwork contributions. Another purpose of the project is to point to artists who died of AIDS. The project is a five minute before twelve memorial, for sensitivize people of the destruction of the natural environments on earth in order to preserve and protect them. A progressing online project, initiated 2002 and finalized 2004, dealing with all forms of violence, practiced as domestic violence in families or aggression in form of war. The 2003 edition dealing with the aspect of war, was launched on the day when the Iraq war started on 20 March 2003.
was initiated on occasion of the Tsunami disaster in Southeast Asia in December 2004. The project is also memorial and symbol for human helplessness and weakness against the uncontrollable powers of nature. 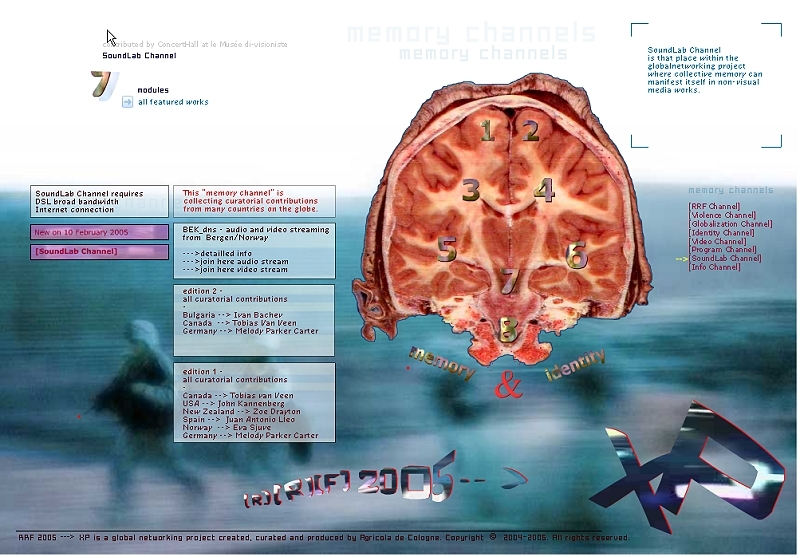 Global networking project, featuring how people all over the world deal with memory. 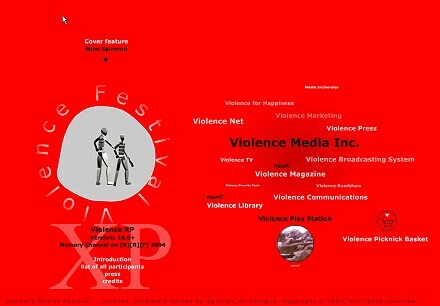 Created for Biennale of Electronic Arts in Perth/Australia (2004). videoChannel and Soundlab became afterwards individueal media art projects, for art & moving images and soundart. a memorial project dedicated to the “Desapparecidos” (the disappeared) and the Mother of Plaza de Mayo Buenos Aires/Argentina, who resisted against the military rulers in the Argentine dictactatorship of 20th century. The project is a curatorial collaboration between Raquel Partnoy (Argentina/USA), herself a mother of a persecuted and disappeared child, and Wilfried Agricola de Cologne, who designed and realized this project. Besides numerous historical testimonies, young Argentine female artists – Irene Coremberg, Marina Zerbarini, Andamio Contiguo, Anahi Caceres and her ArteUna network – reflect this traumatic historical Past by using New Media technologies. The project was realized in 2004 in the framework of the global networking project [R][R][F]200x—>XP, but is acting also separately. dealing with new forms of the Holocaust remembrance. Auschwitz as a 3D model. …………………The diasporadic story of this family is typical for many Jews whereever they live. in particular its female representatives Raquel (mother), Alicia (daughter) and Ruth (granddaughter). By origine Russian and persecuted in the home country, Raquels family emigrated to Argentina expecting to find the paradise on earth, but just to find out that the family was again persecuted during the military dictatorships in 20th century in Argentina, but survived and emigrated to USA finally. The diasporadic story of this family is typical for many Jews whereever they live. The 3rd and final version of this project was completed in the framework of the reception of the MOSAICA Award on the theme Jews and Disaspora. Exhibition project in an exchange between virtual and physical space in solidarity with the Palestinian enclave close to Jerusalem, eg. Bethlehem. launched on 27 January 1995 and destroyed at the end of 1998. 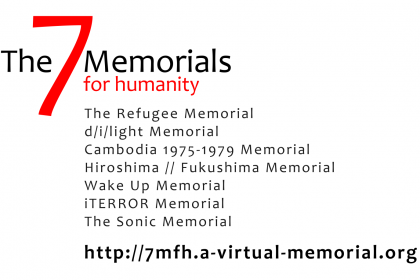 The virtual memorial – initiated on 27 January 2015, the 20th return of the project launch – is representing an attempt to reconstruct and document this comprehensive media art project.